Some issues also available via Internet at NASS web site. Address as of 7/14/98: http://usda.mannlib.cornell.edu/reports/nassr/field/ppo-bb/; current access is available via PURL. 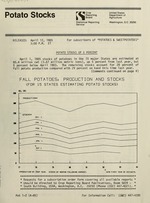 Crop Reporting Board, Statistical Reporting Service, U.S. Department of Agriculture. Vols. for <Feb. 14, 1984>-198 issued by: U.S. Dept. of Agriculture, Statistical Reporting Service, Crop Reporting Board; <1986- > by: National Agricultural Statistics Service, Agricultural Statistics Board. Issued also to depository libraries in microfiche, <1987>-1996. Latest issue consulted: Feb. 13, 1992.
lReprutg Uoard Pubicaone. SRS. U.S.